We love nettles – they are one of the first wild greens available in the spring, easy to find, bursting with goodness and absolutely delicious. March and April are the best months to pick them, while the nettles are still very young and tender. Take only the top four or six leaves of each plant. You’ll need stout gloves for picking and washing them but their sting disappears as soon as they hit hot water. This simple tart is a great way to enjoy them. Put the nettle tops in a sink full of cold water and wash thoroughly, picking them over to remove any unwanted plant matter or insect life. Transfer to a colander. Bring a large pan of salted water to the boil. Add the nettle tops, prodding them down with a wooden spoon. Once simmering again, cook for 4–5 minutes, or until tender. Drain in a colander and leave to cool. Preheat the oven to 200°C/Gas 6. Scatter a baking sheet with polenta, or grease it lightly with oil if you prefer. Use your hand to squeeze all the liquid out of the drained nettles. Put them on a board and chop coarsely, then transfer to a bowl. Add the 2 tablespoons olive oil, garlic, a light grating of nutmeg if you like, and some salt and pepper. Mix well with a fork, working the seasoning into the nettles. Lay your ready-rolled pastry sheet on the prepared baking tray. If using a block of pastry, roll it out on a lightly floured surface until about 5mm thick, trim the edges to straighten, then transfer to the tray. Spread the nettle mixture over the pastry, leaving a 1–2cm clear border at the edge. Crumble over the cheese. Bake for 20–25 minutes until the pastry edges are puffed and golden. 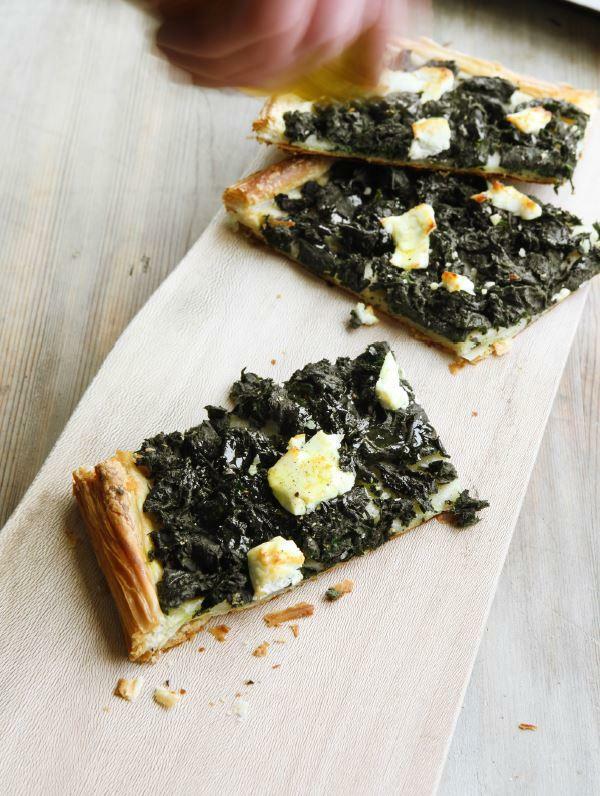 Trickle the tart generously with extra virgin olive oil, sprinkle with salt and pepper, then serve. You can have this topping on a pizza base, instead of puff pastry. Make the pizza dough (on page 183) and prepare it for topping as described. Sweat a couple of onions in olive oil, cool, then spread over the pizza base. Top as above with nettles and cheese and bake as for the pizza.